From the 1650s to the 1770s, the Coastal Plain Region of the land we now call North Carolina changed greatly. European American settlers began arriving, pushing back the Native Americans who had lived there for thousands of years. Against their will, many Africans and African Americans were forced to settle in the area as slaves. They came with European settlers from other colonies or were imported from other countries. What is the North Carolina Coastal Plain? The plain stretches from the present-day Virginia border to the present-day South Carolina border. It reaches inland from the Atlantic Ocean to the fall line, which roughly follows the western edges of present-day Northampton, Halifax, Nash, Johnston, Harnett, Hoke, and Scotland Counties. The Coastal Plain can be divided into three subregions: the Albemarle, the middle Coastal Plain, and the Cape Fear. Each of these subregions has a different geography and a different history of settlement. The first part of North Carolina to be settled by European Americans was the Albemarle. The Albemarle extends from the border with Virginia to the north shore of the Albemarle Sound. After the failed Roanoke colonies in the 1580s, the English focused on colonizing present-day Virginia. But in the mid-1600s, Virginians began exploring and acquiring land in the Albemarle area. Why did they begin settling there? Most hoped to find better farmland and to make money by trading with the Native Americans. By 1655 Nathaniel Batts, a trader with the Indians, became at least a temporary resident of Carolana. The first permanent inhabitants were probably John Harvey and his family, who were living in the area by 1659. As more Virginians moved into the Albemarle, its population grew to several hundred settlers by the 1660s. In 1663 King Charles II granted Carolina to eight prominent Englishmen, who were called the Lords Proprietors of Carolina. Settlement was slow in the first decades of the Lords Proprietors' rule. High taxes, uncertainty about land titles, attacks by Native Americans, and inefficient government all discouraged immigration and settlement. The difficulty of traveling into Carolina also discouraged immigration. The Outer Banks, which are barrier islands along the coast, were dangerous to ships and discouraged immigration by sea. Many ships ran aground in the shallow waters near these islands. 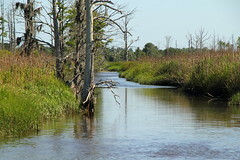 The Great Dismal Swamp, poor roads, and rivers that were difficult to navigate also made traveling difficult. But settlers did find ways to migrate into the area. Many from Virginia traveled by land or journeyed up the Elizabeth and Nansemond Rivers and down the Chowan River. Others may have come to Carolina by ship, sailing from other colonies along the Atlantic coast and passing through the Outer Banks at Currituck and Roanoke Inlets. In the late 1600s some settlers began crossing the Albemarle Sound to settle in the middle Coastal Plain, which stretches from the Albemarle Sound to present-day Duplin and Onslow Counties. By 1691 they had settled along the Pamlico River in Bath County. More settlers traveled down the coast to settle in present-day Craven County by 1703, Carteret County by 1708, and Onslow County by 1714. These settlers included people from the Albemarle, Virginia, Maryland, and New England as well as immigrants from England. Like those who settled in the Albemarle, these people hoped to profit by farming the colony's fertile land and by trading with the Native Americans. French, German, and Swiss people also settled in the middle Coastal Plain. Many French Huguenots had settled in Virginia. But as the population in Virginia grew, land became more scarce. As a result, some Huguenots moved to Carolina. One group settled at the head of Pamlico Sound in 1690, and another settled along the Trent River around 1707 or 1708. Swiss people and Germans from the Palatinate also came to present-day North Carolina. The Swiss were fleeing religious persecution, and the Germans were fleeing war, cold winters, and poverty. In 1710, under the direction of Baron Christoph von Graffenried, the Swiss and Germans created and settled the town of New Bern and other areas near the joining of the Neuse and Trent Rivers. The settlement of New Bern may have sparked the Tuscarora Indian War (1711–1714), in which the Tuscarora Indians were defeated. Immigration to the middle Coastal Plain increased afterward because the war reduced the threat of Indian attacks on settlers. In the mid-1720s, the first permanent settlers arrived in the area around the lower Cape Fear River. Their arrival was due mainly to the efforts of South Carolina planter Maurice Moore and North Carolina governor George Burrington. Moore had come to North Carolina to help fight the Tuscarora Indians. He became interested in settling in the Cape Fear area and encouraged others in South Carolina to settle there as well. Burrington ignored South Carolina's claim to land on the west bank of the Cape Fear River. Instead, he granted this land to settlers who left South Carolina to settle in North Carolina. The settlers from South Carolina were fleeing economic depression, high taxes, and political unrest in their colony. Other settlers came from England, Scotland, and Ireland as well as the colonies of Massachusetts, New York, Pennsylvania, and Maryland. 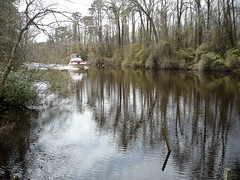 Some traveled on a new one-hundred-mile road between the Neuse River and the Cape Fear River. Most settlers were attracted to this region by vast amounts of unclaimed land that were available and by commercial opportunities offered by the Cape Fear River. Since the Cape Fear River was the only deep river in the Coastal Plain that emptied into the ocean, large ships could travel it to the ports of Brunswick and Wilmington. As a result, settlers could send their goods to market and could trade with other colonies and with Europe more easily. In the 1730s Welsh and Scotch-Irish began settling in the Cape Fear area. Around 1730 a group of Welsh settled along the Northeast Cape Fear River. In the mid-1730s Swiss from South Carolina and Scotch-Irish also settled in the area. The Scotch-Irish were fleeing high rents, heavy taxes, and famine in Ireland. The Swiss soon departed, but the Scotch-Irish remained on land along the Northeast Cape Fear River. Lowland Scots, often merchants, also came to North Carolina. While some went north to the Albemarle, many went to Wilmington to improve their fortunes. Highland Scots immigrated to North Carolina as well. The first group arrived in 1739. Many more came in the following years, especially in the 1760s and 1770s. They settled in the upper Cape Fear Valley in present-day Fayetteville and in present-day Anson, Bladen, Cumberland, Harnett, Hoke, Moore, Richmond, Robeson, Sampson, and Scotland Counties. Some of the Highland Scots may have been political refugees fleeing Scotland after a failed uprising against the English. But most wished to escape the high rents, unemployment, and poverty in their country. African Americans, most of whom were slaves, greatly added to the population of the colony. By the time North Carolina was settled, slavery had developed in Virginia and South Carolina. White Virginians and South Carolinians who immigrated to North Carolina often brought slaves with them. Slaves were also brought from abroad. Available records of slaves imported from 1749 to 1775 show that 68.6 percent came from the West Indies and 15.6 percent from Africa. 11.6 percent of slaves imported during this time came from other mainland colonies. The origin of the remaining 4.2 percent is unknown. Most slaves lived in the lower Cape Fear area, where early immigrants from South Carolina brought the plantation culture with them. Though most settlers lived on small farms, some settlers owned large tracts of land and large numbers of slaves. These plantations produced most of the colony's rice, indigo, and exportable naval stores. The fertile land in this area and the closeness of the Cape Fear River made trade with other colonies and with Europe profitable. These factors encouraged the plantation culture here. Slaves were not as common in the Albemarle and middle Coastal Plain for a number of reasons. First, just as the Dismal Swamp and poor roads made travel and immigration by land difficult, they also made importing slaves by land difficult. Also, the dangerous Outer Banks and the absence of a deepwater port discouraged importing them by sea. Second, getting goods to market was difficult. The rivers in these areas emptied into sounds, not the ocean, and ports along the rivers were located far inland. This meant that boats required more time to reach port, to pick up or deliver cargo, and to return to the ocean. Because getting goods to market was so difficult, most settlers could not make money by raising crops for export and did not need slaves. Though some did grow wheat and tobacco for export, many lived as subsistence farmers. Differences in geography, economic interests, and settlement patterns divided the Coastal Plain and helped make each subregion different. Swamps, rivers, and poor roads made transportation, trade, and contact between them difficult. North Carolina lacked a unifying, common urban center such as Williamsburg in Virginia or Charleston in South Carolina. Few economic ties bound coastal inhabitants together. The Albemarle counties tended to resemble Virginia. Early residents came from Virginia, used Virginia ports for trade, and used Virginia money. On the other hand, the Cape Fear, with its plantation culture, large number of slaves, and concentration of wealth, resembled South Carolina's Low Country. At times, these differences caused political conflict. In the 1740s and 1750s, for example, the Albemarle counties opposed the southern counties' demand for equal representation in the colonial legislature. They also opposed the southern counties' desire to place the colony's capital in New Bern. After resolving these conflicts, however, the counties in the Coastal Plain became more united. In the 1770s, they worked together to oppose the demands of the newly settled and growing area called the backcountry, or Piedmont Region. Tefft, Michael. March 28, 2009. "Dismal Swamp Canal, North Carolina." Located at http://www.flickr.com/photos/mtefft/3409094053/. Accessed February 24, 2012. Frailey, Zach. February 15, 2011. Bath, North Carolina. 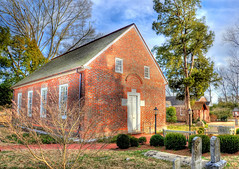 "St. Thomas Episcopal Church, Built 1734." Located at http://www.flickr.com/photos/zrfraileyphotography/5453621050/. Accessed February 24, 2012. June 11, 2011. Wilmington, NC. "Cape Fear River Tributary." Located at http://www.flickr.com/photos/mr_t_in_dc/5840694661/. Accessed February 24, 2012. May 4, 2010. "Albermarle Sound, North Carolina." Located at http://www.flickr.com/photos/48722974@N07/4579229370/. Accessed February 24, 2012. 1 January 1995 | Watson, Alan D.
My eighth great grandfather, Wm Wyatt, grandson of Rev Haute Wyatt was born in Perquiminans County 1652, when it was part of Southside, prior to founding of NC several years later. Based on NC 1660 population of 1,000, the European population of the 1652 future NC area likely was less than 100. What was the first european settlement in NC? I hope this helps. Please reply back if you have additional questions or need additional help locating information. What did people do for a living then?